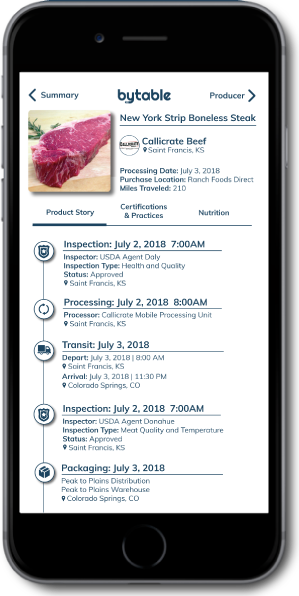 We use blockchain and IoT technology to build traceable, transparent food systems. Because it shouldn't take an investigative journalist to find out where our food comes from. A food recall costs $10 million on average, not including damage to your brand. Can your company survive a food recall? 73% of consumers are willing to pay more for transparent food products. 56% of them say they would be loyal to that brand for life. Can you afford to not be transparent? Unlike most blockchain solutions, Bytable puts data assurance at the forefront. To ensure the data entered onto the blockchain is verifiable and accurate, Bytable builds our blockchain infrastructure around quality standards and auditable IT controls. Ready to make your supply chain traceable and transparent? Sign up for our newsletter for food news, store discounts, progress updates, and releases! The Future of Food is Transparent. Copyright © 2019 Bytable Inc.